If you came here from our Vacation 2010 sites, click the green traffic light to return. 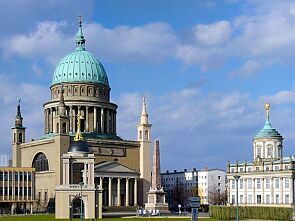 Potsdam's Old Market Square (Alter Markt in German) is the historical center of town. Throughout the last 400 years it went through the same turmoil as the rest of the town and has seen – and survived - its fair share of fire, bombs and wrecking balls. 1945 Originally, the square was part of the City Palace which dominated the place from 1666 until 1945. 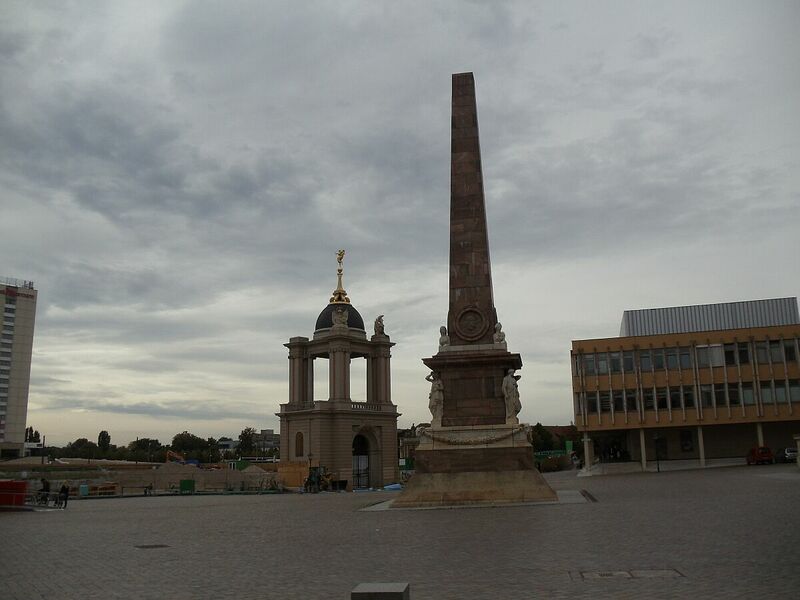 In 1745, King Frederick the Great ordered a complete reconstruction of the square. Between 1753 and 1755, architect Johann Boumann added new buildings to the east side. Based on plans made earlier by Georg von Knobelsdorff, the forefront of St. Nicholas Church was redone in 1755 and an obelisk was erected in the square's center, giving the whole assembly a Roman attire as desired by the King. Only a few buildings survived the bombing raids of World War II and the restoration afterwards took 36 years (77 years if one includes the City Palace). The City Palace on the south side of the square and the bombed out buildings on the north side were demolished in 1959. 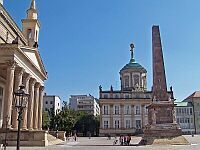 The Old Town Hall was reopened as a cultural center in 1966; a modern building, hosting the city library and a teacher's seminar was built on the north front between 1971 and 1977; the Obelisk was brought back to its old place in 1979 and the St. Nicholas Church didn't reopen until 1981. 2007 2010 Currently, the entire area is - yet again - a giant construction site. 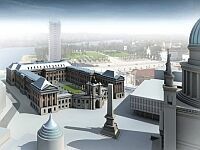 By 2012, a new House of State Parliament, resembling the old City Palace, will complete the reconstruction of the square. 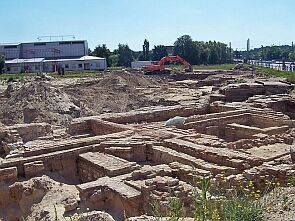 In conjunction with the current reconstruction, archeological excavations started in 2002. They were supposed to document the outline of the walls around the former City Palace. What they found instead was one of the greatest discoveries in recent time: Outlines of medieval quarters, dating back to the 1300s. They were probably dismantled in the 1600s, when construction of the City Palace started. 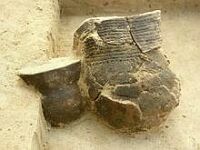 Digging even deeper and further back in time, the archeologists found parts of a Hevelli fortress from about 850 and a Bronze Age grave site containing two pieces of pottery (picture left) that were dated back to 2700 BC. 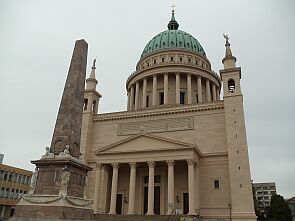 No matter where one goes in Potsdam, everything radiates the spirit of a millennium. After our 2007 visit, we returned in 2010 and had a look at the construction site. 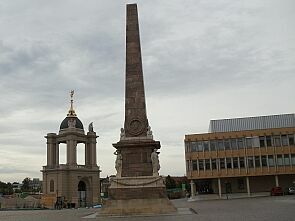 Currently, the Church, the Obelisk and the Fortuna Portal tower over a whole lot of nothing, but that is all going to change in 2012. 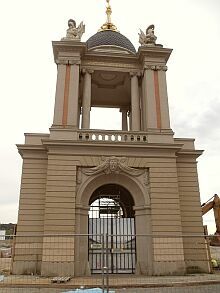 Financed by private donors, the Fortuna Portal - gate the City Palace's court yard was rebuilt already in 2001 to push the issue of reconstructing the entire ensemble, which finally started on March 25, 2010. We have a lot more on the history of almost every single building around the square. Click the links below. to the bombing raids of World War II and have endured more reconstruction than any other building in town. Click here to visit Potsdam's oldest church. 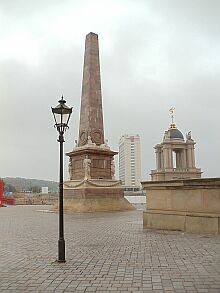 In 1755, the Old Market Square was redesigned and got a Roman-Italian attire. 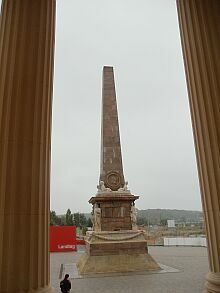 This obelisk, marking the center of the square, was part of it. 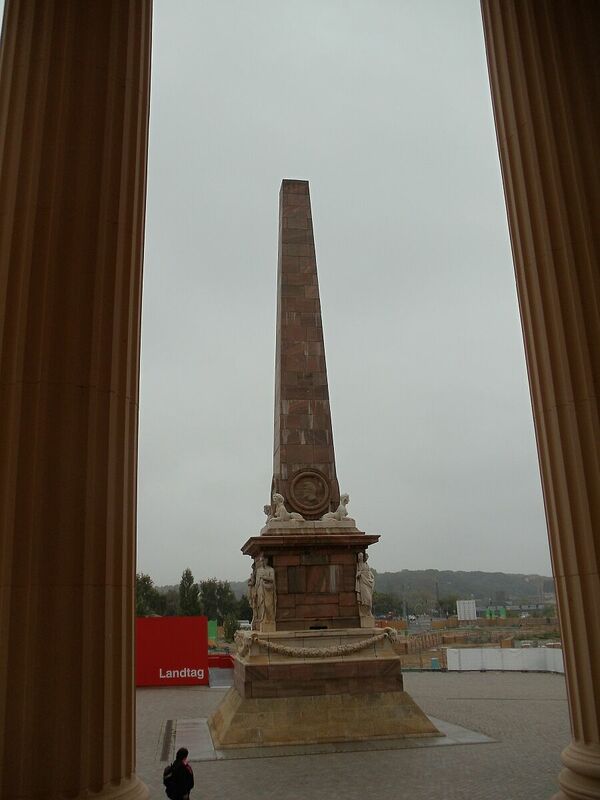 Click here to see one of Potsdam's three obelisks. These buildings at the east side of the Old Market Square were built in the 1750s, but the history of the area is a lot longer. 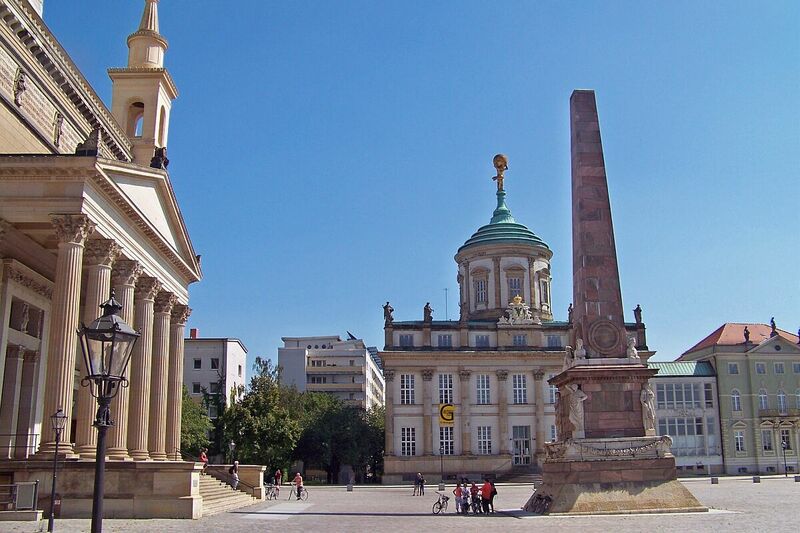 Potsdam's first town hall was built here in 1524. 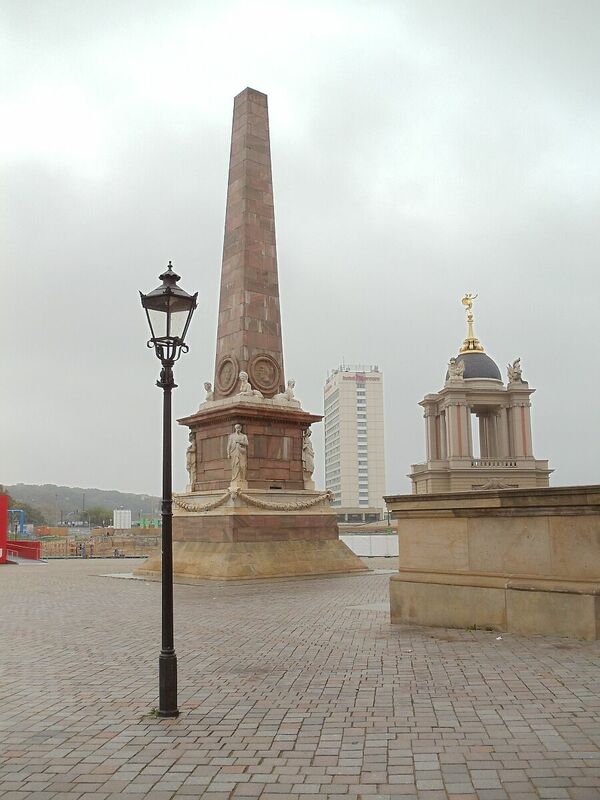 Click here to check out more of the Old Market Square's history. 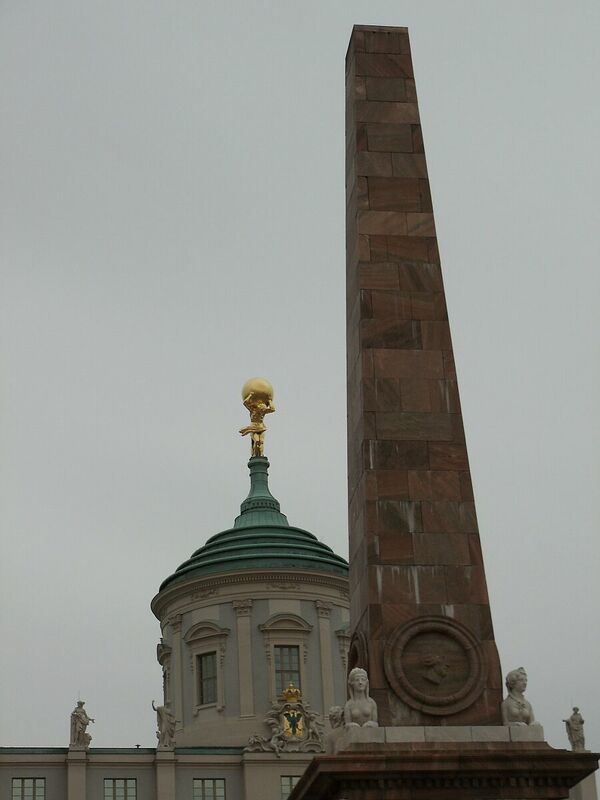 For the last 250 years, Greek titan Atlas on top of the Old Town Hall has not only carried the world on his shoulders but also has endured everything that nature and history could throw at him – from battles with gravity to battles with Russian artillery. 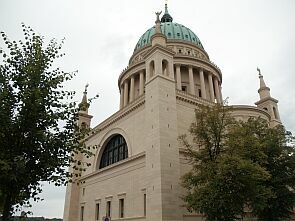 Click here to see one of Potsdam's most popular landmarks. 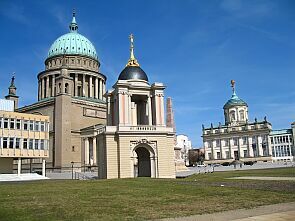 There are two modern buildings close to the Old Market Square (and closely related to it too): Potsdam's new Theater and an assisted living facility at the grounds of one Potsdam's oldest churches. Click here to check out two of Potsdam's most modern buildings. 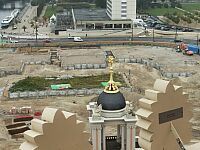 the reconstruction of the square. 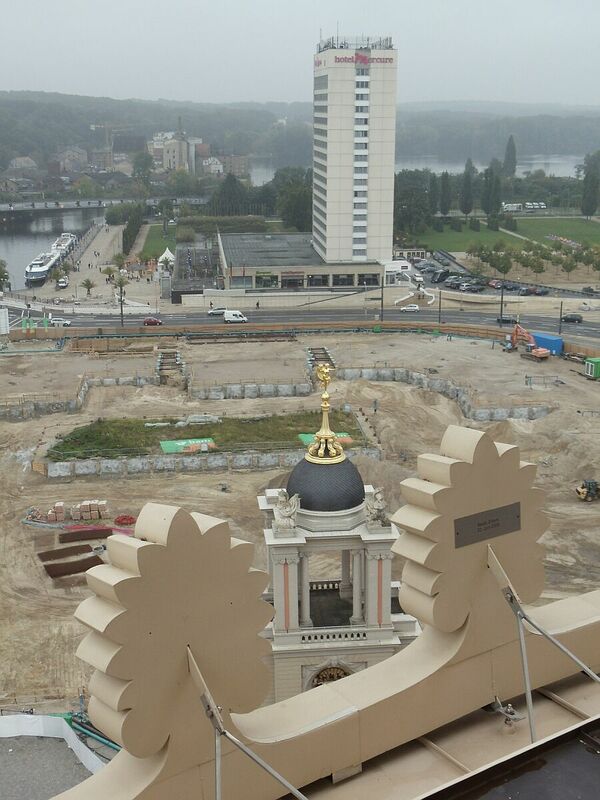 Click here to watch rise, fall and rebirth of the City Palace.